When these Yorkie puppies are small, people usually think that Yorkies are the most ideal and adorable pets to have, but you should carefully think while buying a Yorkie as they become totally different in appearance when fully grown into an adult Yorkie. American Kennel Club (AKC) categorizes Yorkies in the toy group that means that Yorkie is an adult mature dog of around 2-3 kg and 6 to 9 inches height is measured from ground level to its limbs. Although they are tiny but still fall into the category of sturdy dogs. 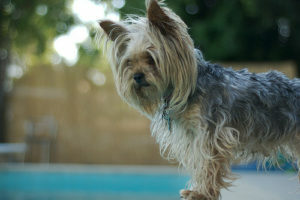 Yorkie is ideally an indoor dog that really loves playing, running and jumping all around the home. Another unique characteristic of this breed is that they are very curious and every time exploring nature, they also love to do digging, but this needs proper training. They often curl their bodies like a ball when taking rest. They can become very different dogs in appearance and behavior if groomed perfectly. The standard of breed means that how a dog will look like when growing into an adult. AKC is an American Kennel Club that is the most reputed in the country. The club has professed certain standards of every breed of dogs. However, the standards set are not hundred percent precise but determined by the expert judges from the relevant field. Toy Terrier is described by the AKC as a compact small sized dog with a well-proportioned body stature, averagely sized tail, bluish tanned body coat, the attitude of dog is mentioned to be energetic and arrogant. Skull is small with a less protruding muzzle, medium sized black eyes with glaring expressing of wisdom and intelligence. The texture of hair is smooth and silky that needs trimming. Yorkie puppies are mostly black in color that is a bit tanned until fully grown. The tan is darker in the roots then in the middle. The color of hair is slightly bluish mingled with deep black. If a dog is bought from a good reliable breeder then there is almost no difference between a show class and pet Yorkie. A good breeder will always want to breed a puppy that matches the standards of the AKC. A pure Yorkie is meant to fulfill all the standards of the AKC and always achieve good results in dog shows. So when you buy a dog from a reliable breeder, you can trust that he will suggest you a show class dog, otherwise, if the dog does not fulfill these criteria then it will be sold as a pet category dog.